Thou wouldst fain destroy the temple! If thou be Jesus, Son of the Father, now from the Cross descend thou, that we behold it and believe on thee when we behold it. If thou art King over Israel, save thyself then! God, My Father, why has thou forsaken me? All those who were my friends, all have now forsaken me. And he that hate me do now prevail against me, and he whom I cherished, he hath betrayed me. Lyric excerpts from the Fifth and Fourth and Words, respectively, of the Seven Last Words of Christ orchestral work by Joseph Haydn. Single-minded dependence on a collapsing auto industry doomed Detroit. An inability to diversify economically doomed Detroit. Public mismanagement and political corruption doomed Detroit. An inability to effectively deal with its racial matters doomed Detroit. The dramatic and total loss of its tax base doomed Detroit. That’s it, people, they seem to reason. The Motor City’s fall from grace is as simple as that. You do the things Detroit did, and you get what Detroit got. You defer decisions just as Detroit did, and you too will suffer the consequences. The speed with which the various articles on Detroit came out proved to me that many writers anticipated the announcement with at least a twinge of glee. You can find Detroit in Cleveland, St. Louis, Buffalo, Milwaukee, Baltimore and Philadelphia. You can find it in Indianapolis, Minneapolis, Cincinnati, Columbus and Louisville. You can find it in Atlanta, Miami, Houston, Dallas and Phoenix. You can even find it in Las Vegas, Seattle, San Francisco and Portland. And yes, you can definitely find it in New York, Chicago, Los Angeles and Washington, DC. You can find elements of the Detroit Dystopia Meme™ in every major city in the country. Yet Detroit is the only one that owns it and shoulders the burden for all of them. But let’s leave that aside. I’m pissed because no one seems to acknowledge the central reason Detroit is filing for bankruptcy now. It has endured abandonment – white flight abandonment – on an absolutely epic scale. Before there was auto industry collapse, before there was a lack of economic diversity, before there was mismanagement and corruption, there was abandonment. People skirt and dance around the issue when they talk about the loss of Detroit’s tax base. What Detroit lost was its white people. The chart above illustrates how Detroit’s unique experience when compared to similar cities. Detroit is what happens when the city is abandoned. And frankly, there is a part of me that views those that abandoned Detroit with the same anger reserved for hit-and-run drivers – they were the cause of the accident, they left the scene of the crime, and they left behind others to clean up the mess and deal with the pain. What’s worse, so many observers seem to want to implicate those left behind – in Detroit’s case a large African-American majority community – for not cleaning up the mess or easing the pain. Their inflicted pain which they’ve made ours. Poor neighborhood identification, or more broadly a poorly developed civic consciousness. A housing stock of poor quality, cheap and disposable, particularly outside of the city’s traditional core. A poorly developed and maintained public realm. A downtown that was allowed to become weak. Lack of or loss of a viable transit network. A local government organization type that lacked accountability at the resident/customer level. An industrial landscape that was allowed to constrain the city’s core. The auto industry created modern Detroit simply as its dormitory and workshop, attracted polyglot millions to it, used it, and now threatens to abandon it. Civic consciousness played little part in the lives of the masses of Irish, German, Poles and Italians who flocked to Detroit in search of a Ford or Dodge or Packard pay check, and who settled there in islands of their own – any more than it played a part in the managements of Ford or Dodge or Packard themselves, or in the crowd of Negroes who also descended upon the city during the boom years of the Second World War… Indeed, it is remarkable that any sense of civic responsibility at all should have been generated in so rootless and transient a community. What can a city do when it finds its patron industry and its middle class moving out, leaving it a relic of extremes?... But urban deterioration offers at least one advantage. Once a city core has become as run-down as Detroit’s you can start to rebuild fairly cheaply. Yes, that is from 1957. Between 1950 and 1970, the decline in Detroit’s white population was on the low end of the spectrum of cities on this list, but it was in the ballpark. Prior to 1970, Detroit and St. Louis were the white flight laggards. After 1970, the bottom fell out and Detroit stood alone. While there certainly are economic reasons white residents may have had for moving, this graph may lend credence to the twin theories of Motor City white flight – the 1967 riots and the 1973 election of Mayor Coleman Young. I’m not trying to persuade anyone of the invalidity of their decision to move from Detroit. There were good reasons and not so good reasons. I’m only trying to describe its impact relative to other cities. And where exactly are those white residents who left over the last 60 years? Certainly many have passed on. Some are currently in the Detroit suburbs or elsewhere in Michigan. Some are part of that great Detroit Diaspora that took them to New York, Washington, Charlotte, Atlanta, Houston, Phoenix, Los Angeles, Seattle and Portland. There are clearly at least 1.5 million reasons why white residents left Detroit. But the fact is, had Detroit experienced white flight at the same combined rate as the other cities on this list, and not experienced any other changes, there would be nearly 350,000 more white residents today. Maybe 140,000 more households. Maybe more stable neighborhoods. Can you imagine that? An additional 350,000 residents means Detroit would still be a city with more than one million people. It would likely be viewed in the same way that a Philadelphia or Baltimore is now – challenged but recovering – instead of the urban dystopia it’s widely seen as today. What impact would that have had on the city’s economy? On the metro area’s economy? On the state’s economy? Or simply the city’s national perception? Silly of me. Abandonment is the American way. Nonetheless, I view Detroit’s bankruptcy announcement positively. It acknowledges that its troubles are far deeper than most realize. It can be the springboard for fiscal recovery, a re-imagining of the city and an actual and complete revitalization. Detroit indeed is in uncharted waters, and its abandonment means that in many respects it could be viewed as a frontier city once again. I would not be surprised if, after restructuring and reorganization, after recapturing its innovative spirit, the city could see growth almost like it did at the beginning of the twentieth century, mimicking what, say, Las Vegas has done for the last 40 years. Even at this dark moment, Detroit has assets that are the envy of other cities. But let no one forget that it is abandonment that brought Detroit to this point. This piece originally appeared at The Corner Side Yard. Submitted by Mike E on Sun, 08/04/2013 - 14:37. Interesting Article Pete, But It was not just whites that fled Detroit. Many well educated well groomed blacks left it as well. The people who stayed were those who could not afford to relocate. If one single thing killed Detroit it would be the interstate Hwy system. The interstate allowed for travel to distant suburbs. It also allowed for suppliers to move further out of the City Limits. The people that were left in the city did not have the capital, connections or in most cases the experience to operate a successful business. Especially in a changing climate where business was being consolidated to form large tier II suppliers. In most cases those who had small parts businesses were on a road to certain failure. Additionally, people forget that it was not always the big three in Detroit. There were once many automotive and appliance makers in the area. Submitted by lyle on Tue, 07/23/2013 - 15:11. To illustrate why industry did not continue in Detroit look at the Hamtramick GM assembly plant (Hamtramck is an island city inside Detroit). (Built in 1980) It replaced an old Chrysler plant but needed much more land to operate. (moving from a multi-story assembly plant to a basically single/2 story plant). To do this it needed eminent domain to buy up the surrounding community to get a big enough site. It took 5 years and a couple of trips to the Michigan Supreme court to get approval for this as it did destroy an existing community, called Poletown. The delay involved in this demonstrates that its much easier to build a plant on a greenfield site. So the auto industry build on the outskirts of the metro area because on a rural site you can buy the entire site likley with one transaction and no eminent domain involved. This one attempt to bring jobs back to Detroit demonstrated the futility of trying to bring manufacturing jobs back, as plant design had changed in the interim resulting in much larger spaces (As a comparison consider that all new auto assembly plants in the US were build to greenfield sites). So one is back to the question should the city of Detroit have had the ability to use eminent domain to assemble sites for auto plants? Now today it might be much easier as there is a lot of unoccupied (all be it with trashed houses) land in Detroit. Submitted by PhilBest on Thu, 07/25/2013 - 02:01. You are right that there is great opportunity for capitalists to set up new ventures on disused low cost land in Detroit now, and this is a major reason that will help it rebound economically. It is noticeable how cities in the UK can go for decades with high unemployment and industries closing and people leaving, without the cost of land falling - even derelict properties have "holdout" price tags. This is a legacy of the strict central urban planning systems they have over there. This is NOT an advantage to them, by the way. Quite the contrary. Submitted by Jay on Tue, 07/23/2013 - 09:56. I read this blog nearly every day, and am nearly always impressed with the writing, and the arguments made. Joel Kotkin, what happened? Why do you publish fact-less, left wing drivel like this. This could have been written by Al Sharpton himself. "Blame the white man for the failings of the inner city!" There's too much to say in response, so I won't even bother, and just hope that this article is an aberration. And frankly, there is a part of me that views those that abandoned Detroit with the same anger reserved for hit-and-run drivers – they were the cause of the accident, they left the scene of the crime, and they left behind others to clean up the mess and deal with the pain. What’s worse, so many observers seem to want to implicate those left behind – in Detroit’s case a large African-American majority community – for not cleaning up the mess or easing the pain. "The Origins of the Urban Crisis"
Submitted by peter on Tue, 07/23/2013 - 13:19. That is the title of an excellent study of postwar Detroit by Thomas Sugrue that covers the period from Detroit's population boom in the 1940s up through the riots of the 1960s. If you are really interested in understanding what happened to Detroit, I suggest you read it. It is simply ignorant of history to say that white flight, race relations, segregation, suburbanization, and disparities in wealth and education have nothing to do with what Detroit is today. Those factors are exactly the reasons why Detroit became a dysfunctional city. The middle class left the city decades ago. Jobs left the city decades ago. The people left behind were largely poor, underskilled, underemployed, and lacking the same opportunities as the folks who picked up and left. There are a lot of political opportunists saying that Detroit went bankrupt because of the tax-and-spend liberals or the unions or the politicians, and that is just sad. Submitted by PhilBest on Tue, 07/23/2013 - 06:20. Submitted by NEOFORD on Tue, 07/23/2013 - 04:29. This is a well-written and knowledgeable article (finally) about Detroit, but I'm having trouble agreeing with your bottom line conclusion: that abandonment of the City by white households caused the decline and now the Chapter 9 filing of Detroit. I think you are mistaking causation with effect. Was "white flight" the primary cause of the illness, or was it just one of the symptoms? Of course the cause and effect loop is always a bit blurry, but I'm not convinced. I agree, the Detroit example of over-specialization gets blown out of proportion. There are plenty of examples of basically the same thing happening with different industries - look no further than Pittsburgh (Steel), Hartford, CT (Insurance), Charlotte (Textiles) - or if you want to keep it closer to home, Gary, IN (also at one point a major agglomeration of the steel industry). I think its a pretty simple story actually: successful cities are capable of re-inventing themselves. Charlotte is one of many examples of a formerly "over-specialized" City that has successfully done so (it's now a major domestic financial center, which also captures the benefits of tech/aerospace growth in the broader region). Gary is certainly not an example of reinvention, and obviously, Detroit isn't either. Maybe someday...but for now Detroit still clings to the coat tails of GM and Chrysler. There is nothing wrong per se with a big City having one "calling card" industry. Most of them do. They just have to make sure they have some other raison d'etre. If the middle class white residents had felt (a) that there were any hope that the City would reinvent itself, or (b) that there was any reason - but for employment - to live in Detroit, I don't think the abandonment would have occurred on the scale it did. Yes, in the 50s and 60s, before the full-on decline of the auto industry, Detroit was already experiencing the departure of whites. But keep in mind - that was also the period during which the post-war suburban lifestyle rose to prominence. 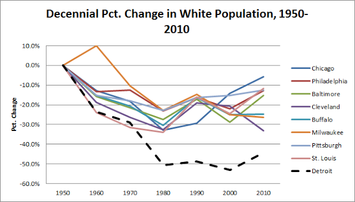 Did the Detroit Metropolitan Area experience a mass exodus of whites? No. They just re-located within a relatively small region. In fact, the metro area experience rather tremendous growth during the 50s and 60s (40% growth over these two decades) despite the economic and political headwinds of the Central City. As your own chart demonstrates, Detroit was by no means the only urban area faced with this challenge. The decline in Detroit was a bit steeper than most - but was certainly not a uniquely dire situation to any unbiased observer. The challenge of encouraging people to "stay and make it better" becomes exponentially more daunting when there is no real reason to be confident about a City. People that have the means to vote with their feet usually do so. The fact that Detroit experienced an exodus didn't cause it to be in the position its in today - it was in my opinion a normal reaction to economic, political and social circumstances of the time and place. After the initial perception of decline and stagnation is solidified (who really knows when that occurred), it almost becomes a self-fulfilling prophecy. If in 1970 Detroit had actually pursued some form of intelligent economic development and planning strategy that recognized reality rather than political opportunism, it may indeed be compared today to a Philadelphia or Baltimore. Submitted by AlexB on Mon, 07/22/2013 - 19:40. First off, people have been discussing race and white flight in Detroit for a long time, and I don't think the author is shedding much new light on the topic. The notion that the huge degree of white flight sets Detroit apart is a bit different. The author failed to say much about whether the extreme white flight was caused by the city's excessive decline, or whether the excessive decline was caused by the extreme white flight. I believe that he began to get close to the answer with the discussion of at large political districts, but still skirts around the issue. If you look at a map of race in the region of Detroit, it is painfully clear that the division of white and black neighborhoods occurs right at the political border between the city of Detroit and its suburbs. This is what makes Detroit so much worse than other American metropolises where the dividing lines are usually aligned with highways such as the Cross Bronx. Although on a much smaller scale, the city of Newark is really very similar to Detroit in terms of how it failed. Newark tried to expand its borders in the early 20th century as its neighbor New York City had done at the end of the 19th, but the existing towns resisted and remained separate. As revenues dwindled and more and more voters were poor and black, the result was black politicians raising taxes on those with money or property to keep these cities afloat, accelerating the exodus. Because of at-large districts in Detroit, once the majority changed, no one with money or property had any stake in the process (Newark is much smaller so the way districts vote isn't as important). All the things that could be taxed eventually left, and racism just accelerated that process. That's why Detroit and Newark have such stark demographic differences right at their borders and why they both seem locked in a downward spiral. In addition to losing their tax base, they were also left with decaying infrastructure, high crime, and an at-risk society that taxed the justice and social welfare systems. While white flight in most cities was about racism, cheap land and cheap car-based transportation (or at least cheap enough for the middle class), in Detroit it also became about escaping a political structure. The evidence for this is that the line between white and black in other cities that had white flight is not exactly at the political border. Individual member city council districts could have slowed the decline, but the only real way to have stopped it would have been to grow the political boundary of Detroit to match the metropolitan area of the city like they do in Europe. That way, the region could have sprawled and segregated, but it would not have lost its economic vitality or become entirely tied with one ethnic and socio-economic group. Submitted by monroedavid on Mon, 07/22/2013 - 15:05. I found this to be a pretty confused and confusing assessment from a site that usually is much better. Pete Saunders identifies white flight as the main reason for Detroit’s demise, but he doesn’t explain the why of Detroit’s massive white flight, compared to other cities. I don’t have the answer, and he doesn’t give me one that makes sense. Plenty of other cities have had black mayors and race riots, two factors he mentions. He refers to his chart—you have to go to his site for that chart. It compares white flight in various Northeastern and Midwestern cities. I’d like to see Houston added to that chart. Why? See the current Smithsonian Magazine article on Houston. Houston is now a minority-majority city and the most diverse big city in the U.S. I don’t have the figures at hand, but I bet if you looked at the number of whites in Houston in 1950 and the number of whites in Houston today, the actual number has increased despite that percentage decrease. Why? Because of overall growth, of course. And why has Houston grown along with its diversity? The Smithsonian article mentions some important reasons—minimal regulations, lack of zoning, and an entrepreneurial spirit at all levels of the social spectrum. Were the whites in Detroit in 1950 excessively of a “cracker” mentality? Ha—I grew up in Houston in the 1940s and 1950s, and you had to head east to Mississippi to find a more cracker mentality. This is a fascinating topic to me, and an important one for the nation, but I don’t find the answers in this article. Submitted by lyle on Mon, 07/22/2013 - 16:20. The difference is that in Tx a city like Houston can block creation of new cities up to 5 miles away from its city limits. Then Houston, created a bunch of narrow strips along the major highways leading from town up to 10 miles from the current boundries (no vote is required in the annexed area, and also likley these areas had little population at the time). As a result with few exceptions Houston does not have suburban towns around it. Southeast towards Galveston is the exception. Going west Houston could grow another 10 miles before hitting limits. Now the school district situation is different where HISD the central houston district is typical of urban districts, but most suburban areas are in other districts organized long ago, and since there was no forced consolidation schools are not unified. So in summary Tx law allows Texas Cities to prevent the creation of suburban cities, all have taken advantage of this to at least some extent.